TULSA, Okla. - They call it the Dream Meet. More than 600 gymnasts from across the state are competing at the Cox Business Center this weekend dreaming big. “I want to go to the Olympics and go to UCLA or OU,” Zi’Asia Zachary said. 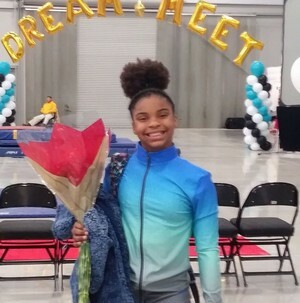 Zi'asia has been competing in gymnastics for two years now. For her, the sport is her life. “Heaven forbid she misses a day, or she'll probably be very angry,” her mother Antoenete Zachary said. It's where Zi’Asia goes to get away. “If I'm having like a rough day I’ll go to practice and my friends they'll help me just forget about all the hard times,” Zi’Asia said.